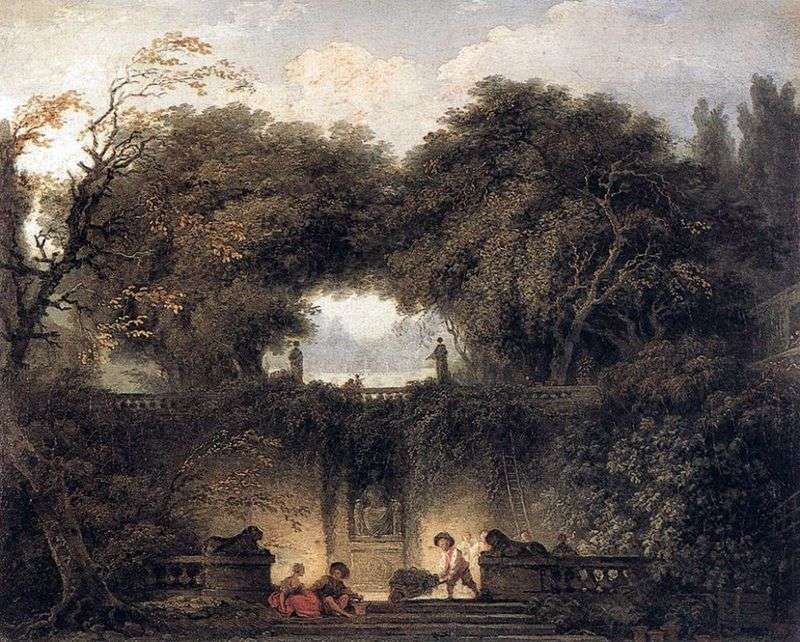 For a long time, art historians could not decide where the “small park” written by Fragonard was located. These topographical doubts are perfectly demonstrated by the catalogs of the Wallace Collection published at different times. So, in the catalog that appeared in 1900, it is said that the painting depicts the forest of Fontainebleau near Paris. In the catalog of 1903 the same place is evasively called the “Roman villa”, and in the catalog of 1913 this picture is called “Gardens of Villa d’Este in Tivoli”. Under this title, the picture existed for more than half a century, but in the 1989 catalog it also appears as “Little Park”. The same is called the engraving of Fragonard, on which the same landscape is present. In recent years, it is more often asserted that in both works the artist did not represent any particular place, but an imaginary landscape, most likely inspired by memories of the happy months that the young Fragonard spent in the summer of 1760 at the Villa d’Este in Tivoli. Description and meaning of the painting A small park by Jean Honore Fragonard.